We are heading into the home stretch of our poster primary contest. Contestants in this round: USC, East Carolina, Nebraska, UCLA, Notre Dame, Washington State and Illinois. Click here to view all of the candidates on one page. For newbies to the site, here is the background on the contest. Each year, the Wiz displays poster schedules of Division I-A teams. But this year, in an attempt to keep things fresh, it was decided to put the posters up to a vote of fans to determine the Wiz Readers' Choice Poster of the Year. One problem: With roughly 70 posters in hand, it was necessary to thin the herd before a final vote. Thus, the idea of poster primaries came to be, with each primary having seven posters. This is the ninth of 10 primaries. The winner of each primary will advance to the final. Voting for each primary will remain open until midnight Sept. 21 (a week from Monday). The 10 finalists will then advance to the final and voting will begin for the Wiz Readers' Choice Poster of the Year. That poll will remain open until midnight on Sept. 29. Primary No. 1: West Virginia has a 250-vote lead over Iowa State. Primary No. 3: Michigan State clings to a 128-vote lead over North Carolina. North Carolina State and Missouri are third and fourth. Primary No. 4: Surprising Louisiana Tech has a 1,573-vote lead over Colorado. Florida State is a distant third, followed by the Florida. Primary No. 5: One of the tightest races of all. Middle Tennessee leads Bowling Green by only 40 votes. Washington, Wisconsin, Auburn and Kansas State continue to get blown out. Primary No. 6: Penn State is beating Iowa by 827 votes. Brigham Young is third and Houston, fresh off the upset of Oklahoma State, is fourth. Primary No. 7: Oklahoma has a 247-vote lead over Louisiana Lafayette. Still time for Tennessee, Minnesota, Texas El Paso and Syracuse to make a run. Primary No. 8: The tightest race of them all. Louisiana State holds a 27-vote lead over Georgia Tech. Michigan was expected to be a factor but is a distant third. The Trojans cleared one of their biggest hurdles toward a possible berth in the BCS title game Saturday night with an 18-15 victory at Ohio State. The trip to Columbus started a stretch of six of eight games on the road. October features road games at California and Notre Dame. Thanks to Tim, Adam and Ken. The Pirates warmed up for road games at West Virginia and North Carolina with a 29-24 victory against Division I-AA Appalachian State. Also of note is East Carolina's Nov. 5 game against Virginia Tech at Greenville. Thanks to Michael! Look closely at the Cornhusker poster, there's something missing. Let's see, there's Bob Devaney and Tom Osborne, Frank Solich and Bo Pelini ... 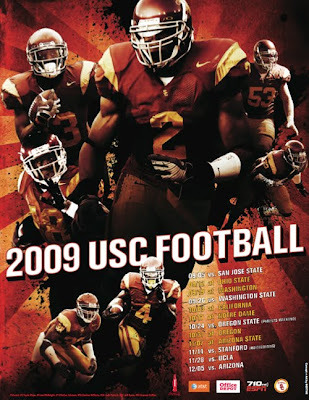 Wait, where's Bill Callahan, who was 27-22 in four seasons as coach? 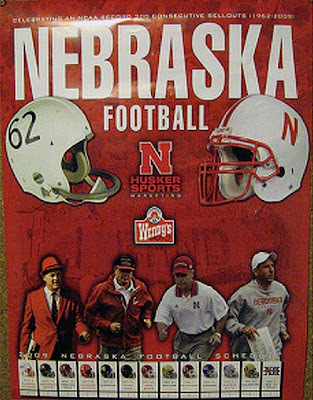 That's right, Nebraska has taken a page from the revisionist history playbook by deciding to leave Callahan off the poster. Thanks to Sammy at Double Extra Point and our good buddy Paul. Rick Neuheisel's second season as Bruin coach got off to a successful start with a 33-14 victory against San Diego State. Now comes the tough part — a trip Saturday to Tennessee to play a Volunteer team set on revenge. UCLA won last season's matchup at the Rose Bowl, 27-24, and that game helped send Tennessee into a tailspin that resulted in Phil Fulmer being ousted as coach after a 5-7 season. Thanks to Jana! The Fighting Irish brushed aside Nevada, 35-0, to set up Saturday's showdown at Michigan. Notre Dame was expected to have plenty of firepower on offense, with 10 returning starters, but the shutout of the Wolf Pack was a surprise. If the defense plays at a high level, the Fighting Irish will likely finish the season in a Bowl Championship Series game. Thanks to Brian, Gary and Notre Dame Sports Properties.